1. Los Angeles Rams – Carson Wentz, QB, North Dakota St. – The Rams have two really strong options for the top pick, but everyone seems to be convinced that they will draft Jared Goff strictly because he is a California guy and played in the big conference. Wentz is the more naturally talented passer and leader, and since Jeff Fisher already groomed a small school quarterback who nearly took his team to a championship in Steve McNair out of Alcorn State, this pick seems much less risky than if it were some other regime. 2. Cleveland Browns – Myles Jack, LB, UCLA – The best players have been getting taken at the top of the draft in recent years, which bucks the trend to be honest. 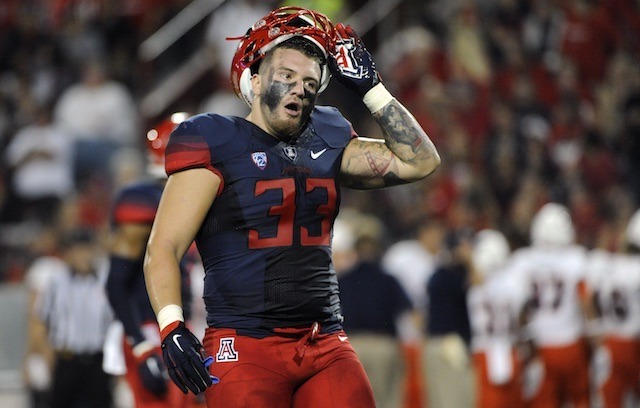 Jack might not be ready for the start of camp, which might upset some Browns fans initially, but he is a game changer and is the type of dynamic defensive player who can change the culture in Hue Jackson’s tenure. 3. San Diego Chargers – Jalen Ramsey, S, Florida State – Ramsey is the best player in the draft. He is by far the best safety and is probably the best cornerback as well. The departure of Eric Weddle opens up a big hole for the Bolts, so my guess is their jump at one of the best DB prospects in years. 4. Dallas Cowboys – Ezekiel Elliott, RB, Ohio State – Letting Demarco Murray go a year ago is still an embarrassment for the Cowboys. With Tony Romo’s injuries last season, it was clear that there was a major need at the running back position when they could not move the ball despite having a polished offensive line. Elliott will change the way they look at their running backs, a back with speed to hit the outside and toughness to block and make his money between the tackles. 5. 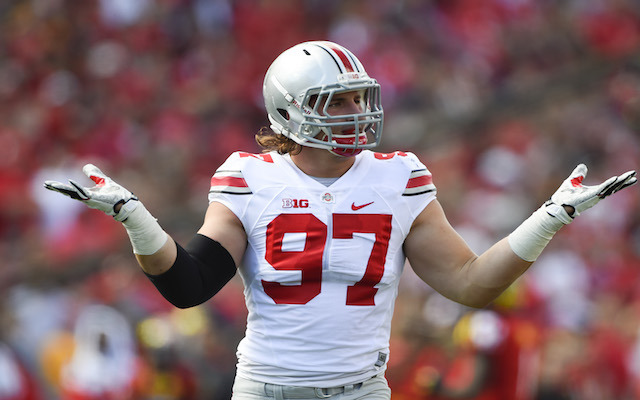 Jacksonville Jaguars – Joey Bosa, DE, Ohio State – The Jags need front seven help, and with Jack going higher than expected, they are left with a player who is arguably the most pro-ready player in the draft. His motor doesn’t quit, and I just don’t buy the drawbacks that everyone is bringing up about his character concerns. 6. Baltimore Ravens – Laremy Tunsil, OT, Mississippi – This would be a dream pick for Joe Flacco, who didn’t have a whole lot of time to do anything last season. Tunsil is the best pass blocker in the class, and it is the biggest need for the Ravens. 7. San Francisco 49ers – Jared Goff, QB, California – So, the 49ers get lucky here. Goff is the type of player who can do wonders with the right offense and right set of weapons, but the 49ers don’t exactly have that at the moment. The best case scenario would be for Goff to sit a year behind Blaine Gabbert and take in Chip Kelly’s offense before having to take meaningful snaps. 8. Philadelphia Eagles – Vernon Hargreaves III, CB, Florida – The Eagles are suddenly very thin at the back end of their defense thanks to the flop free agent signing of Byron Maxwell. Hargreaves is the best cover corner in the draft, and he will be an impact player from day one. 9. Tampa Bay Buccaneers – DeForest Buckner, DE, Oregon – Sometimes it works out perfectly for teams. The Buccs could not get after any passer last year, and Buckner is one of the most gifted D-linemen in the draft. He will be a work in progress in the beginning, but he could be a real threat by midyear. 10. 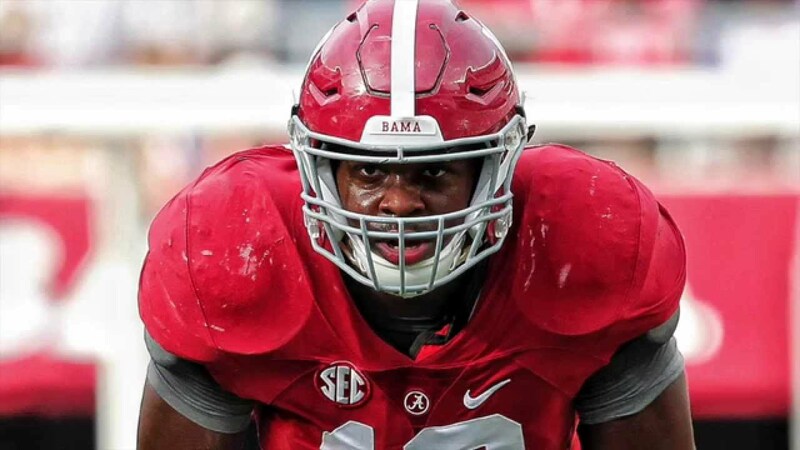 New York Giants – Reggie Ragland, LB, Alabama – He will be an immediate starter in the middle of the tortured Giants defense. They are basically good to go on offense. If they draft another skill position player, then I would really have to question the firing of Tom Coughlin. 11. Chicago Bears – Eli Apple, CB, Ohio State – This will be severely overdrafting the corner, but he is one of the higher upset secondary guys in the draft. In that division, you have to be able to lock down the wideouts. Apple will struggle early on, but he could develop into a lock down corner in a couple seasons. 12. New Orleans Saints – Shaq Lawson, DE, Clemson – The Saints need all kinds of help on defense, much like the Giants. Remember that 52-49 game last year? Lawson will be the type of player that will be able to create matchup problems on the interior and get after the quarterback. 13. Miami Dolphins – Noah Spence, DE, Eastern Kentucky/Ohio State – Spence had some issues that removed him from the Buckeyes program and forced him to play his final year in FCS. He was dominant at both levels, and the Dolphins need pass rush help, as usual. Spence could be an immediate starter on that defensive line. 14. Oakland Raiders – Mackenzie Alexander, CB, Clemson – I would have put William Jackson here, but I’m not sure if the Raiders want another Houston corner after DJ Hayden has disappointed as much as he has. Alexander had no interceptions in his career at Clemson, but he is a talented lock down corner that will help the Raiders, who already have a stout pass rush. 15. Tennessee Titans – Ronnie Stanley, OT, Notre Dame – This would be the best case scenario for the Titans, who were going to probably take a tackle with the first pick anyway. Stanley is a day one starter for a team that could not protect Marcus Mariota at any point in 2015. 16. Detroit Lions – Jack Conklin, OT, Michigan State – The Lions have never made much of an effort to keep Matthew Stafford upright. Now without Calvin Johnson to bail him out all the time, they absolutely need to address the left side of that putrid offensive line. 17. Atlanta Falcons – Hunter Henry, TE, Arkansas – Henry is far and away the best tight end in the draft. He might not be the best value at this point in the draft, but he fills a big point of need at a constantly increasing position of importance in today’s game. 18. Indianapolis Colts – Laquon Treadwell, WR, Mississippi – The Colts definitely have needs on defense, but they need to find a permanent replacement for Reggie Wayne since he left and hung up his pads last year. Treadwell might not be the best receiver in the class, but he fits what they are looking for. 19. Buffalo Bills – Robert Nkemdiche, DT, Mississippi – Rex Ryan will have no problem embracing the character issues of Nkemdiche. He is the type of player who will make an immediate impact on the D-line, playing multiple positions and creating a matchup nightmare. 20. New York Jets – Paxton Lynch, QB, Memphis – This might be a half dozen spots too high for the highly talented Memphis signal caller, but the Jets can’t really risk missing out on him. QB has got to be their #1 need. 21. Washington Redskins – Sheldon Rankins, DT, Louisville – This would be quite a drop for someone as talented as Rankins. The Redskins, despite making the playoffs last year, have holes all over both sides of the ball. This will shore up their defensive interior. 22. 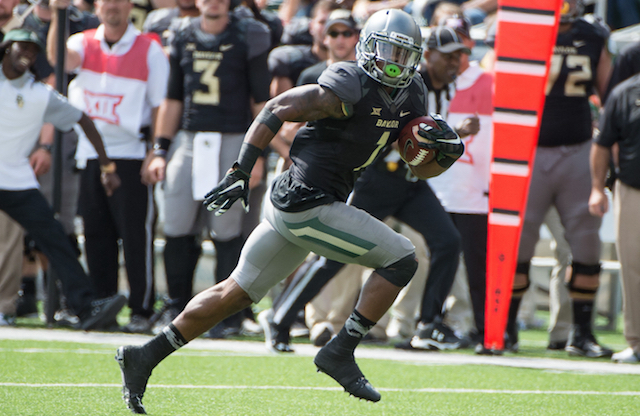 Houston Texans – Corey Coleman, WR, Baylor – He was the best receiver in college football last year. He can stretch the field as well as anyone. Brock Osweiler would have to be thrilled walking into a team with Coleman and DeAndre Hopkins on opposite sides of the field. 23. Minnesota Vikings – William Jackson, CB, Houston – You can never have enough CB depth in the NFC North. Jackson is a gifted player, but he is still a bit raw. This would be a nice landing spot for him. 24. Cincinnati Bengals – Will Fuller, WR, Notre Dame – They lost two of their top three targets for Andy Dalton to free agency, so they have to address that need here in the draft. They could trade down a few spots if need be, but Fuller is a fine pick at this point. 25. Pittsburgh Steelers – Taylor Decker, OT, Ohio State – The Steelers do not have an awful lot of needs, but O-line depth is certainly something that can be improved, especially in that division. 26. Seattle Seahawks – Bronson Kaufusi, OLB, BYU – The Hawks always like to shake it up a bit. Losing Bruce Irvin to free agency creates a void at OLB/rush end, so I can see them going with one of the best players that fits their scheme here. Their offensive line is a mess as well, but all of the good tackles are going to be taken by this point. 27. 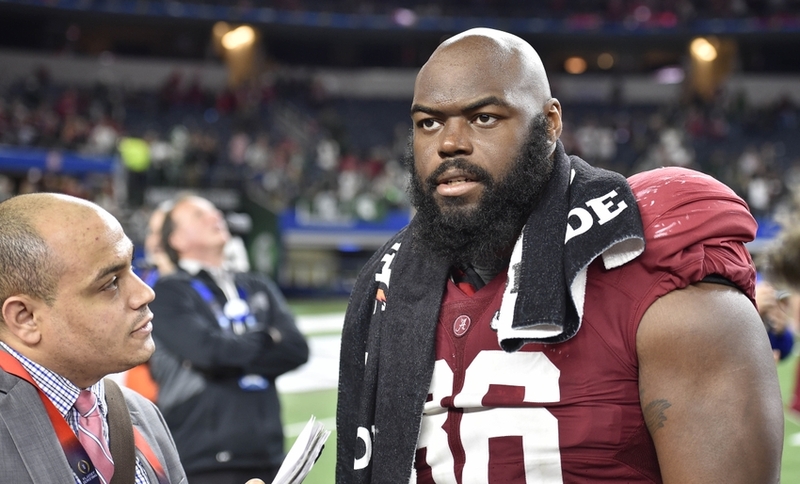 Green Bay Packers – A’Shawn Robinson, DT, Alabama – With BJ Raji taking a step out, Robinson seems like an immediate starter on the interior of that shaky defense. This would be extremely good value at this point in the draft. 28. Kansas City Chiefs – Josh Doctson, WR, TCU – The Chiefs can always use more good receivers. Doctson will add some big play ability to the offense that has always seems a bit one-dimensional. 29. Arizona Cardinals – Ryan Kelly, C, Alabama – It is the end of the first round that we normally see the best center in the class come off the board. Few players have as much experience and winning mentality as Kelly. 30. Carolina Panthers – Vonn Bell, S, Ohio State – The offensive line looked fairly horrible in the Super Bowl, but they really performed well throughout the rest of the season. Bell will provide some playmaking ability in that secondary that looks a bit unstable at the moment. 31. Denver Broncos – Connor Cook, QB, Michigan State – He looks like a Broncos quarterback. If they can’t get a deal done with the 49ers for Colin Kaepernick, then they will be forced to do something to prevent Mark Sanchez from being their only option at the start of camp. Trading down seems likely, but for the sake of making a clean first round, I will have them take Cook here. That first round seems slightly deflated with only 31 picks, but that’s how it goes. Any overlooks? Who do you want your team to pick in round one (if your team has a pick)? Let me know in the comments. And...Go Hawks!